Spokes is often asked to give more coverage to cycling developments in the Lothians – and links between Edinburgh and the Lothians. Our autumn public meeting will therefore be on this topic, and our autumn Bulletin will include a Lothians supplement, with information supplied (we hope) by each Council. We urge Spokes members from outside the city, and other interested Lothians residents, to make this a special date – come along to hear and question your own Lothians councillors. Councillors from the Lothians will also be keen to get feedback from Edinburghers who commute to or go for leisure rides in their areas, whilst Edinburgh Council also needs feedback on the routes to the Lothians. We’d also like to see maximum cooperation (and competition!) on cycling development between the councils, and we hope to foster that by bringing together these top councillors responsible for transport – to hear each other speak and to hear what you, the public, think. 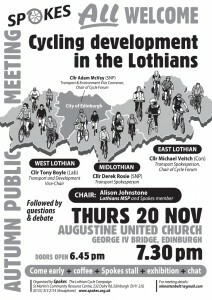 The speakers from the Lothians Councils will talk about cycling developments in their area, including links with Edinburgh. The speaker from Edinburgh has been asked to concentrate on routes in/out of the city, not on cycling developments which are purely local to the city. City of Edinburgh – Cllr Adam McVey [SNP] Transport & Environment Vice Convenor; Chair of the Cycle Forum; SESTRAN* board member. *SESTRAN is the South East Scotland Transport Partnership – not to be confused with Sustrans! More information to follow in the Spokes Autumn Bulletin, late October. Already over 1000 people a day commute across the city boundary by bike, roughly 750 inwards and 350 out. Inward flows include over 200 each from East Lothian and Midlothian; around 100 each from West Lothian and Fife; and a few from even further afield! [source: 2011 census data]. Around 10% of Spokes members live in the Lothians. The Lothians are a great cycling destination, and many city dwellers want to get out there on pleasant and safe routes. Our highly-praised Spokes Maps of East, West and Midlothian are a constant reminder, encouragement and source of the necessary basic information. “Brilliant,” “Wonderful,” “Great,” and “A joy to use” are just a few of the user compliments you can read on our above-linked website maps page. There is gradual progress towards more and better links between the city and the Lothians, and to Fife. The process can, however, be long, arduous and politically fraught, as with our incredible fight for a high quality tourist, commuter and leisure route between Edinburgh and the Forth Bridge. The Lothians councils are far smaller than Edinburgh and so have fewer staff and other resources. There is a need for closer coordination, to cooperate on routes, to build staff expertise, provide mutual backup and learn from each other. Some of this is already being fostered by SESTRAN but a lot more is needed. For example, only 2 of the 4 councils have a Cycle Forum. Edinburgh City Council in 2012 decided to allocate 5% of its transport budget to cycling investment, rising by 1% a year – now 7%. This is unique among Scottish councils (and UK-wide we think). The story is more mixed in the Lothians Councils – although West Lothian has been extremely successful in its bids for Sustrans 2014/15/16 funding. Come to the public meeting! Put the date in your diary now. Join Spokes to keep in touch with developments, and what you can do to encourage more action. Find out more and download your membership form now! We send occasional email circulars specifically geared to Lothians members and issues. Keep your councillors on their toes by contacting them from time to time on the cycling issues that concern you. Find them at www.writetothem.com.